Something of a genre homecoming, Antoine Fuqua's latest film once again finds him delving into the gritty, brutal realm of cops and crooks - as he did in Training Day. Tango is an undercover officer on a narcotics detail that forces him to choose between duty and friendship. Having been to hell and back, he wants out, but the powers that be won't let him quit. Family-man Sal is a detective tempted by greed and corruption. He can barely make ends meet, and now his wife has an illness that threatens the life of their unborn twins. Eddie is nearing retirement age and has long since lost his dedication to his job as a cop. He wakes up every morning trying to come up with a reason to go on living ... and he can't think of one. Fate brings the three men to the same Brooklyn housing project as each takes the law into his own hands. Crosscutting between multiple subplots, Brooklyn's Finest unfolds violently and passionately as coiled, constantly roving cinematography contributes a measure of unease to the underworld action. $13.350 million on 3471 screens. As a filmmaker, Antoine Fuqua made his biggest impact with 2001’s Training Day. He revisits similar territory in 2010’s Brooklyn’s Finest, another tale of cops and seediness. We follow three New York cops whose lives start out independent of each other. Eddie (Richard Gere) feels burned-out on the job and counts the seven days left until his retirement. Despite his short-timer status, Eddie gets stuck with earnest rookie Melvin (Logan Marshall-Green) and has to mentor him during his remaining time. Tango (Don Cheadle) works undercover with Brooklyn gangs but starts to lose his way; the longer he spends with the thugs, the more he begins to identify with them. Because of this, he begs to be taken out of his current path and land a desk job. However, first he needs to bust a crook – an ex-con who previously saved Tango’s life (Wesley Snipes). Sal (Ethan Hawke) needs money desperately, and he’ll get it anyway he can. If this means he must murder other cops – including dirty ones like Carlo (Vincent D’Onofrio) – then so be it. This doesn’t come easily to Sal, though, as his conscience takes a major hit with his actions. The film follows these various stories. And follows them with little interaction. I don’t think it’s unreasonable to expect that an ensemble piece like Finest will attempt to tie its various stories together, especially because it blends them in a non-episodic manner. It’s not like this is Creepshow with its standalone tales; Finest throws all three plots into the blender. In his commentary, Fuqua states that he feels all three tales combine to interlock the leads and make them add up to one person. While I appreciate that he attempted such thematic cohesion, it doesn’t play out on screen. Instead, the three narratives feel separated, without a lot to connect them together and form a coherent piece. This means that Finest usually comes across as episodic plots stuck together with little rhyme or reason, as though the screenwriter came up with fragments for three different movies but couldn’t generate enough material to sustain full-length stories. The tales create minor interest in the viewer but lack the depth necessary to really involve us. It doesn’t help that the three characters come across as standard issue for this sort of movie. We get the dirty cop, the conflicted cop and the burned-out cop – that’s about as far as their development goes. Sure, the film attempts to delve into the characters’ motives, at least in terms of Sal and Tango; we get some feel for why they behave the way they do, but we find less introspection for Eddie. Not that this matters, for all three remain thin roles, and that becomes a big flaw. When we learn little about the characters, we care little about the characters, and that’s an issue in a character-driven movie like Finest. If the flick favored stronger plot elements, it could thrive despite the stock personalities. Unfortunately, it wants to dig into their lives, and that means that it ends up as a fairly generic cop film. Brooklyn’s Finest appears in an aspect ratio of approximately 2.40:1; the image has been enhanced for 16X9 televisions. The movie came with a pretty ordinary transfer. Sharpness seemed erratic. Close-ups and two shots provided decent to good definition, but wider elements lacked much clarity. The presence of some edge haloes didn’t help, as they made the image more tentative than I’d like. Jagged edges weren’t an issue, but shimmering cropped up occasionally, and some compression artifacts caused noise along the way. At least source flaws weren’t a factor, as the flick remained clean. Like many modern cop dramas of this sort, Finest went with a bluish overtones much of the time. Other hues emerged – especially inside clubs, where we found colored lighting – but the blues dominated. The tones tended to be somewhat flat, as even within the stylized palette, they looked less dynamic than they should. The colored lights also appeared a bit messy and heavy. Blacks showed acceptable deepness, but shadows usually came across as somewhat thick. These shots weren’t awful, but they appeared murkier than I’d expect. Nothing about this transfer ever became poor, but the image lacked much clarity and seemed average for SD-DVD. On the other hand, Finest boasted a solid Dolby Digital 5.1 soundtrack. With a mix of action scenes, the soundscape boasted many opportunities for a good swirl of information. These included cars, helicopters, and gunfire for the most part; those elements demonstrated nice localization and meshed together cleanly. The surrounds bolstered the components well and delivered a smooth, involving track. No issues with audio quality emerged. Speech was concise and natural, with no edginess on display. Music displayed good range and vivacity, while effects appeared clear and accurate. Bass response seemed tight and deep as well. All in all, I felt pleased with the movie’s soundtrack. As we shift to supplements, we start with an audio commentary from director Antoine Fuqua. He delivers a running, screen-specific chat that examines cast and performances, sets and locations, score, story/characters/themes, cinematography and visual style, editing, realism and research. Fuqua's discussion leans heavily toward interpretation and the meaning of the film and away from movie-making nuts and bolts. That's fine, as he digs into the flick pretty well and avoids simply narrating the action. Fuqua manages to include enough behind the scenes details to satisfy, and the rest of the track becomes informative. I may not care much for the movie, but Fuqua explains his methods/purposes well. Under Featurettes, we get four clips. These fill a total of 24 minutes, 30 seconds and include “Chaos and Conflict: The Life of a New York Cop” (6:51), “Boyz n the Real Hood” (5:47), “An Eye For Detail: Director Featurette” (6:35) and “From the MTA to the WGA: Writer Featurette” (5:17). Across these, we hear from Fuqua, screenwriter Michael C. Martin, stuntmen Eddie Speller, Eric Dequan Shaw and Rasheem Tripps, extra Errol Mac, producers John Langley, Basil Iwanyk and John Thompson, and actors Ethan Hawke, Don Cheadle, Richard Gere, Wesley Snipes, Jas Anderson, and Shannon Kane. The shows cover story, characters and research, cast and performances, shooting in New York, visual design and Fuqua’s approach to the film, and aspects of how Martin created the script. That final thread – represented in “MTA” – offers by far the most interesting. Finest represents Martin’s first filmed screenplay, so it’s fun to hear his unusual story. The rest of the material tends to be pretty forgettable, though, as the featurettes largely stick with fluffy material. We get a few minor details, but the footage remains more promotional than I’d like. Seven Deleted Scenes go for 31 minutes, 17 seconds. These tend toward expository moments, mostly as they relate to secondary characters. We see an extended version of Tango’s traffic stop, and we get more with Caz, Sal’s family and Eddie’s “girlfriend”. None of these contribute much. Some extended endings prove to be a little more interesting. The first shows that a character we assumed died didn’t, and it also lets us see the family of another deceased person. In the second, we find out what happened to one of the leads after the climactic evening. The latter’s a very dark finale, so I’m glad the filmmakers nixed it; the released film comes with a depressing enough conclusion, so the addition of this scene would make the flick even more downbeat. A few ads open the disc. We get clips for Spartacus: Blood and Sand and The Crazies. In addition, we find the trailer for Finest and previews for Pandorum, Law-Abiding Citizen, and Ultimate Fighting Championship under “Also On DVD”. 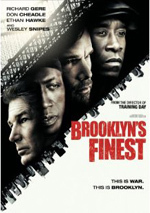 Because it focuses on its main characters – and none of those characters rises above the level of “stock” - Brooklyn’s Finest lacks much power. We don’t get to know the personalities above a superficial level, so our investment in them – and interest in their stories – fails to thrive. The DVD presents average visuals, very good audio, and a generally positive set of supplements highlighted by a good commentary. Although I wouldn’t call Finest a poor film, it’s not one that rises above genre mediocrity.